Sperry gyro-stabiliser. View of a gyro-stabiliser installed in the engine room of USS Aramis, a 350 tonne guardship and Admiral's barge. Gyro-stabilisers are gyroscopic control systems that control the movement of stabiliser fins on a ship. When the gyroscope senses ship roll, it changes the angle of the fins to exert force to counteract the roll. The system shown here was developed by US inventor Elmer Ambrose Sperry (1860-1930). Here, the ship's diesel engines can be seen (foreground, left and right). 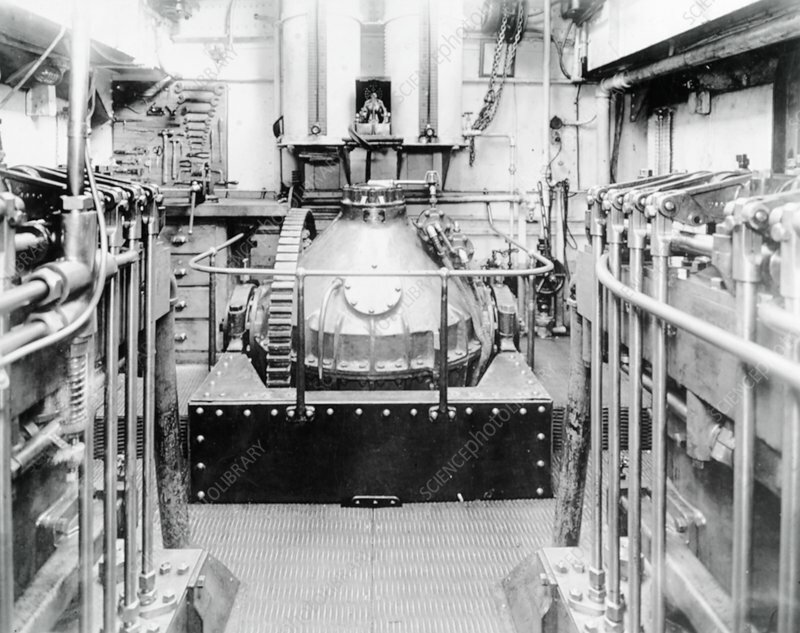 The small control gyro immediately over the main gyro between the two tanks is the 'mind' of the equipment, and acts to start the precession of the main gyro before the roll of the ship takes effect. Photographed in New York Harbour, USA, circa 1920.